The Demise of the American Republic! Sadly, few Americans realize that our nation was founded as a constitutional republic–not as a democracy. The founders of America established the republic understanding that, if the nation were to prosper, our society–especially our government–must be based upon biblical principles and not the ever-changing whims of the people. The founders left a trail of documents testifying to this fact and also warning us of the internal threats that could destroy our nation. The very things they warned of are presently gaining prominence in our culture and are greatly contributing to our demise. Our founders also understood something that the Bible teaches repeatedly–history repeats itself. Unfortunately for us, many of our contemporary leaders are either ignorant of this truth or choose to ignore it. They are currently pursuing an agenda that, historically, has always failed. Laws now being passed by the Federal government, as well as by some state legislatures, ignore the guiding principles set down in our Constitution and, more importantly, they defy and redefine the laws established by the Supreme Judge of the universe. It is foolhardy to think these decisions won’t affect whether or not God blesses or curses this nation. Shall we remain deaf to the voices from the past? Will we continue ignoring the warnings of Scripture? Will we continue racing headlong toward division, anarchy, terror and collapse? Is it too late to reverse this trend? 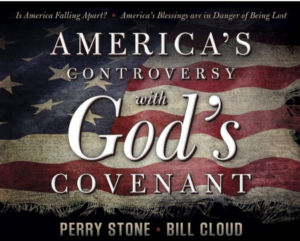 In this book, Perry Stone and Bill Cloud combine their scriptural insight and present to you an urgent message that every concerned American, particularly those who are God’s people, should read and respond to–before it is too late.